이재용 삼성 부회장이 보석금이 거부된 재판을 받기 위해 양손을 포승으로 묶인 채 법정에 오가는 모습을 보는 것은 유감이다. 그는 음모를 꾸미는 재벌의 우두머리 이미지와 맞지 않다. 그는 길거리나 자신이 운영하는 회사에서 흔히 볼 수 있는 짙은 색 정장과 흰색 와이셔츠를 입은 차분하고 신중하며 예의바르고 근면한 샐러리맨의 이미지이다. 요란하고 강한 이미지가 아니다. 이 이미지는 한국 밖에서는 ‘Jay Y’ 혹은 ‘JY Lee’로 알려진 이재용이 자신의 아픈 아버지가 삼성 제국을 통해 키우고 세운 강력한 정부의 희생양이 되었다는 인상을 전해주기에 충분하다. 이재용은 한국 경제의 20%를 차지하고 80여개 이상의 회사로 구성된 삼성그룹의 주력 기업인 삼성전자의 부회장이라는 직함을 갖고 있다. 하지만 그는 기업 권모술수에서 자신보다 훨씬 능한 고위 관료들의 손에 휘둘리고 있다. 유감스럽게도 이 모든 사건은 이재용의 아버지인 이건희가 3년 반 전 심장마비로 쓰러진 후 혼수상태에서 깨어나지 못하고 있는 가운데 이재용에게 회사에 대한 모든 책임이 주어졌다는 것을 말한다. 이건희는 여전히 삼성전자 회장 직함을 갖고 있지만 그룹의 전략을 수립하는 데 참여도 못할 뿐 아니라 어떤 결정도 내릴 수 없는 상태다. 사실, 이재용은 수년 간 주변 사람들로부터 경험에서 우러난 자문을 받으며 후계자로 준비해오다 이 책임을 떠맡게 되었다. 이것은 이재용이 다른 두 명의 삼성전자 중역과 함께 체포, 구속되었는데도 삼성전자 제품의 세계 판매가 끄떡없는 원인을 이해하는 데 도움이 된다. 이재용이 5년 징역을 다 살든 아니면 매우 가능성이 높은 것으로 집행유예로 일찍 감옥에서 나오든 상관없이 삼성전자의 이익에는 아무런 영향을 미치지 않을 것이다. 삼성의 신형 갤럭시 노트 8이 세계 시장을 강타하고 있는 지금 삼성의 매출액을 보면 삼성전자 경쟁기업인 애플, 마이크론, 인텔, 도시바 등은 이재용 부회장의 사건을 보고 고소해할 때가 아니다. 스마트폰 세계 점유율 12%의 애플보다 두 배 이상 많은 23%를 점유하고 있는 삼성은 1분기에 87억 달러라는 기록적인 이익을 냈다. 불이 붙는 갤럭시 노트 7 참사 후 갤럭시 8 스마트폰의 성공 덕택에 삼성은 올해 2분기에는 124억 달러라는 엄청난 이익을 볼 예정이다. 하지만 장기적으로 삼성은 대가를 치를 것이다. 문재인 대통령이 재벌 개혁에 발벗고 나서고 있기 때문이다. 문 대통령은 몇 세대에 걸쳐 한 가족이 기업을 지배하는 것을 보장하기 위해 동일한 그룹 내 이뤄지는 기업 움직임을 제한하려고 한다. 김상조 공정거래위원회 위원장은 재벌 가족들이 부당이득을 취하는 것은 부(富)를 불법적으로 이전할 뿐 아니라 기업 환경을 파괴한다고 언급했다. 그는 오랫동안 재벌들을 비판해온 단체인 경제개혁센터에서 활동해온 교수로 그동안 모아온 자료를 근거로 이 결론을 내렸고 이런 배경을 적절하게 사용하길 바란다고 분명히 했다. 삼성 문제는 어디서부터 다뤄야 할 것인가? 결국 삼성물산이 제일모직을 합병하면서 삼성전자와 다른 기업들에 대한 자신의 지분을 늘리고 지배구조를 공고히 하려고 했던 이재용의 계획이 될 것이다. 이 합병으로 이재용과 그의 두 여동생은 합병된 회사, 결국 삼성전자를 지배하는 데 필요한 지분을 충분히 갖게 되었다. 780억 규모의 삼성물산과 제일모직 합병이 통과되는 데는 정부 산하기관인 국민연금공단이 뉴욕에 소재한 헤지펀드인 엘리엇 등 소액주주들의 강력한 반대를 무릅쓰고 찬성했기 때문에 가능했다. 삼성은 합병에 대한 박근혜 정부의 지지를 얻기 위해 두 재단에 자금을 주고 박근혜의 오랜 친구인 최순실의 딸이 독일에서 열린 승마경연대회를 위해 멋진 말을 얻도록 돈을 댔다. TV에서 높이 뛰어오르는 말은 이재용 범죄의 상징인 것이다. 그러나 이런 분노가 무슨 차이를 낼 수 있겠는가? 이재용의아버지도 금융법 위반으로 두 번이나 선고를 받았지만 둘 다 사면되었다. 이재용과 두 자매는 여전히 삼성물산을 지배하는 지분을 갖고 있고 매일은 아니지만 적어도 멀리서 통제하고 있다. 이재용은 감옥에서 그렇게 할 수 있을까? 아니면 소액주주들이 더 큰 목소리를 내면서 임원들이 이재용의 권위를 훼손할 것인가? 삼성전자 주식의 절반 이상을 소유하고 있는 외국인들은 비록 공정거래위원회가 결정하겠지만 회사 내부 일들에 관여하고 싶어 한다. 외국인들은 절대로 연합되지 않을 것이지만 공정거래위원회의 요구에 걸맞는 개혁을 요구할 것이다. 하지만 단기적으로 스마트폰과 다른 기기들을 구입한 사람들은 이 차이를 모를 것이다. 그들 대다수는 삼성그룹의 후계자가 감옥에 있다는 것조차 모를 것이다. 그래서 변화가 있다면 그것은 장기적이며 점진적인 것이 될 것이다. 문 대통령은 ‘재벌 개혁의 역설’에 직면해 있는데 이것이 경제성장을 촉진하기보다 경제 발전을 뒤에서 붙잡는 위험을 초래할 수 있다는 점이다. 삼성 사건을 통해 삼성이 가족 밖의 외부 주주들에게 더 많은 역할이 주어지고 삼성보다 작은 기업들에게 더 많은 기회가 주어지는 더 나은 방향으로 나가는 변화가 올지는 두고 볼 일이다. 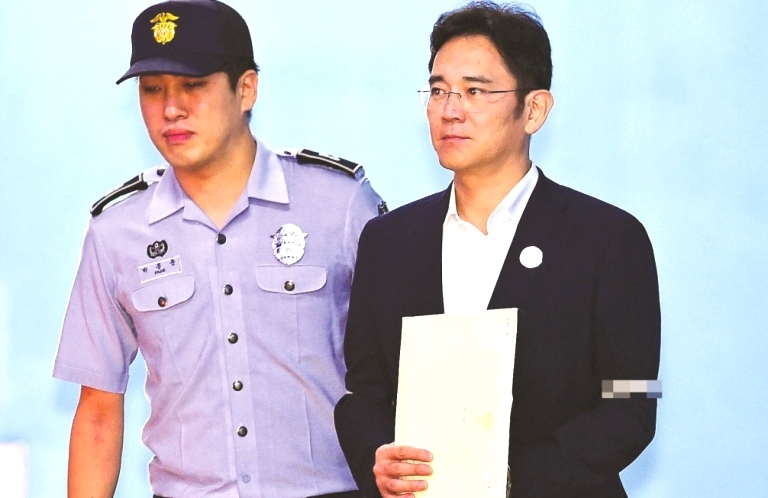 It's easy to feel sorry for Lee Jae-yong as he's led in and out of the courtroom, on trial while held without bail, then awaiting sentencing, finally going to prison, his arms bound in rope, clasped by guards on either side. He just does not fit the image of a scheming chaebol chieftain. Seen on the street or in one of the companies he controls, he might be mistaken for a diligent salaryman, dark-suited, white-shirted, quiet, serious, polite, neither flamboyant nor particularly tough. The visual image is enough to convey the impression that Lee, known outside Korea as Jay Y or JY Lee, is the victim of powerful executives whom his ailing father nurtured and installed throughout the Samsung empire. JY does indeed have the title of vice chairman of Samsung Electronics, flagship of a group that accounts for 20 percent of Korea's economy, and his tentacles extend throughout its 80 or so companies, but he's also at the mercy of a legion of senior bureaucrats who know far more than he about corporate machinations. Sadly, the whole case suggests that JY was over his head after his father, Lee Kun-hee, suffered a terrible heart attack more than three and a half years ago, going into a coma from which he has never recovered. The elder Lee retains the title of chairman of Samsung Electronics but remains unable to make decisions, much less participate in group strategy. In fact, JY was thrust into responsibilities for which he had been groomed for years by men whose advice he accepted as voices of experience. That helps explain why JY's arrest and imprisonment along with two of those executives will not have a lot of impact on Samsung Electronics sales worldwide. There should be no appreciable dent in Samsung earnings regardless of whether he serves all his five-year sentence or, as is quite likely, gets out earlier on probation. The numbers show Samsung Electronics rivals, Apple, Micron, Intel, Toshiba et. al., have no reason to gloat right away while the new Galaxy Note 8 hits global markets. Samsung, selling 23 percent of the world's smartphones, nearly twice the 12 percent sold by Apple, enjoyed a record $8.7 billion profit in the first quarter and a stupendous $12.4 billion profit in the second quarter of this year thanks to the success of the Galaxy S8 smartphone after the disaster of the fire-prone Galaxy Note 7. Longer term, however, Samsung may suffer consequences. That's because President Moon Jae-in is dedicated to reforming the chaebol system, curbing the ability of companies within the same group to guarantee control by the same ruling family from generation to generation. Kim Sang-jo, chairman of the Fair Trade commission, has stated that "profiteering by chaebol owner families not only leads to illegal transfers of wealth but also destroys the corporate eco system." He reached that conclusion from material that he gathered as a professor on behalf of Solidarity for Economic Reform, a longtime critic, and he clearly hopes to make good use of this background. What better place to begin than with Samsung? It was, after all, Lee's scheme to consolidate power by having Samsung C&T take over Cheil Industries, increasing his hold over Samsung Electronics and other companies, that got him into trouble. The result of the takeover was that Lee and his two sisters hold comfortably controlling stakes in the combined company, which in turn dominates Samsung Electronics. For the $7.8 billion deal to go though, the National Pension Service, under the thumb of the government, had to vote its shares over the strenuous objections of a stubborn minority shareholder, Elliot Associates, based in New York. Samsung, to get on the good side of the government of Park Geun-hye, channeled funds to two foundations and donated enough for the daughter of Park's long-time confidante to acquire a beautiful horse for dressage training in Germany. The image of that high-stepping steed on television has become a symbol of JY's crimes. But what difference will all the furor make? No one forgets that JY's father got convicted twice, and pardoned both times, for financial transgressions. JY and his sisters still own controlling shares in Samsung C&T and still rule, if not day to day, at least by remote control. Will JY be able to do so from prison or will his executives undermine his authority while minority shareholders demand a greater say? Foreigners, who en masse own more than half the shares in Samsung Electronics, are sure to want to intervene in the company's affairs even as the Fair Trade Commission challenges its sway over the economy. The foreigners will never unite a bloc, but they may insist on reforms matching those of the FTC. Short term, though, buyers of smartphones and other gizmos and gadgets won't notice the difference. Most of them are probably not even aware that the heir to the Samsung throne remains in jail. If there is to be change, it will be long-term and gradual. For President Moon the "paradox of reform" is that it risks holding back the economy rather than encouraging growth. The challenge of the Samsung case will be to see if it leads to change for the better, a greater role for stockholders outside the family and more opportunities for smaller rivals.